A casement window that we install from Marvin Windows. Casement windows are hinged on the right or left side and open outward by turning a crank handle or simply by pushing. They provide a great view and are easy to open and close. There is no rails to obstruct the view and can be placed anywhere in the home. They have a screen on the inside of them to protect the inside of your home while being left open. 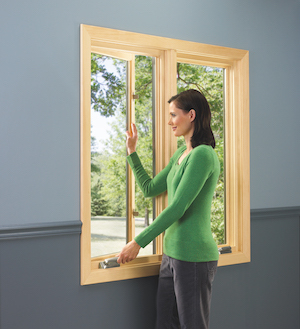 Marshall Exteriors offers a variety of replacement windows that are designed and manufactured to last. We can install wood, vinyl, fiberglass and aluminum casement windows, all with different benefits that can improve the quality of your home. We are the local window replacement company for many areas of New York, including Canandaigua, Fairport, Newark, Geneva. We offer you a Free Estimate to help get started on finding which type of casement window is right for you. If you're looking for expert window replacement, contact us today!